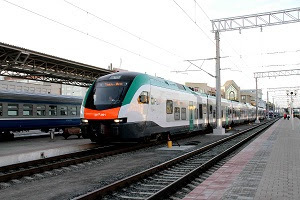 The seven-part Intercity trains FLIRT, which operate on the route of the Belarusian railway between Minsk and Gomel since August 2016, serving as the basis for the new trains. These are 92.96 meters long and 3:48 m wide. Each train consists of 260 seats, of which 16 are in the first class. The seats are distinguished by individually adjustable back- and armrests. The passenger compartment of the first class is separated by an electrically operated glass wall and is provided with conductor call button. By pressing one of these keys, the supervisor receives an audio / video signal in Zugbegleiterraum. In addition, an area for large luggage and a wardrobe are provided. In the passenger compartment of the second class comfortable seats are fitted with armrests in a three-plus-two arrangement. The new trains are equipped with vending machines in the passenger compartment. Moreover, a multi-purpose compartment for passengers will be available with prams, bicycles and large luggage. In the new FLIRTs each window is equipped with a sun blind, which can be fixed flexible. Information on the carriage and seat numbers and all control information is provided for blind and visually impaired in Braille. Each train has three toilets. Of which is designed for a passengers with reduced mobility. The electrically powered trains are to the Internet (Wi-Fi) and a system for strengthening of the GSM signal equipped with wireless access. To increase the efficiency of the driving operation, in addition to the data on the location of the train, transmitted the route and energy consumption to the server of the Belarusian Railways. The trains to be delivered meet all technical standards of the Customs Union (CU TR 001/2011) and fit seamlessly into the existing fleet of the Belarusian Railway with already 18 FLIRT one. They are used on the most popular electrified sections of the Belarusian railway network.